These cat-less downpipes eliminate the primary cats. for increased performance, weight savings and bigger sound. 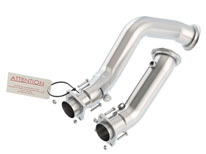 These pipes can be used with both the Borla® Cat-Back systems and the original equipment exhaust system. 2015-2018 F80/ F82 M3/ M4 3.0L Automatic/Manual Trans Rear Wheel Drive.